This never be a plastic toy or something. This is a 2/3 scale reproduction of Yamamoto Kansuke's suit of armor created by our skilled Yoroi artisans, using authentic methods and materials. This product is basically designed to fit childres between 3-8 years old, and/or to be a small display for museums, Dojos, livingrooms, etc... This suit's body armor is constructed by hand, using multiple iron pieces, beautiful lacings and elaborately crafted chainmail. This Yoroi armor comes with all parts and accessories listed in the charts below. 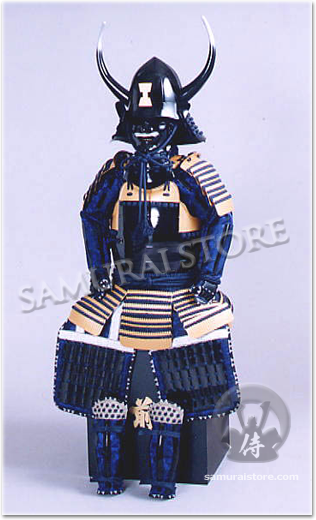 The life size model of the Yamamoto Kansuke's suit of armor is also availble. All the kids-size necessary items (Kosode shirt, Hakama pants, Tabi socks and waraji sandales) to wear this armor are included in this set. You don't need to pick any of optional garments when placing your order if your plan on having your child wear the armor in standard style. Also your armor will also come in a black lacquered wooden storage box that doubles as a beautiful stand for you to proudly display your armor, along with the wooden stand to have the armor stay sitting straight up on the box. 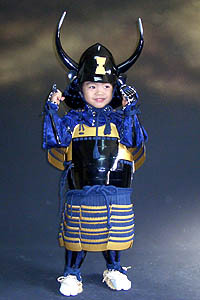 This 2/3 size armor is designed to fit average Japanese children between 3 to 8 years old, up to 125cm height. If you need a larger size, we would be happy to offer you our custom sizing option. Customizing would be available up to about 140cm. A slight fee (up to 30% of the listed price) may be charged, depending on your measurements. It will take 1 to 3 additional weeks to complete a custom sized suit of armor. 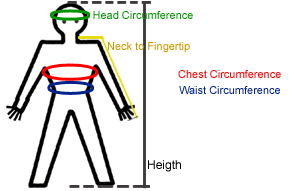 You need to fill your key measurements such as height, chest circumference, waist, head circumference to request a price quote for custom order. We at Samurai Store International know that true Samurai fans could never be satisfied with the inferior, mass-produced armors that come out of many parts of the world. That is why we only offer authentic wearable Samurai armours and helmets that are 100% handcrafted in Japan by skilled craftsmen. by the world's preeminent Samurai Armor manufacturer. Each suit of armor is modeled after examples found in museums, private collections, temples, shrines, hidden storehouses of Samurai clans and other historical sources. All pieces are painstakingly handcrafted by experienced artisans, using authentic methods and materials. Principal parts of the armors and helmets are made of iron or genuine leather, never with plastic. The results of this commitment to quality are finely finished, superbly detailed suits of Samurai Armor that look just as incredible on as they do on display. This armors is designed to fit average Japanese kids up to 125cm tall. If your child will be wearing your armor, and you want the perfect fit, please provide us with your child's measurements to the left. The most economical international carrier we can offer.